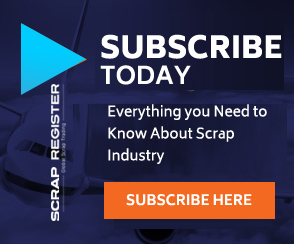 NEW YORK (Scrap Register): Latin America witnessed a hike of 52.9 million mt which was up by 4% on the year-ago period in the finished steel production, regional steel organization Alacero said. Brazil was the main producer with output of 22.4 million mt of finished steel, accounting for 42% of the total, Mexico was second with 18.7 million mt, or 35% of regional output. Crude steel production in the period also grew up by 7% year on year to 63.9 million mt. Brazil was the main producer, with 34.4 million mt (54% of the total), up 10% from the first 12 months of 2016. Latin America's total steel consumption, was 57% corresponds to flat products (37.3 million mt), 41% to long products (26.8 million mt) and 1% to seamless tubes (1.3 million mt)," Alacero said. Apparent consumption of finished steel was 4% higher year on year at 67.3 million mt. Imports of finished steel products in the period was also increased and reached 20.6 million mt, which was up by 4% from a year ago. Of the total, 70% were flat products (14.4 million mt), 27% were long products (5.6 million mt) and 3% seamless tubes (548,000 mt). Currently, imports represent 30% of the regional finished steel consumption, which brings about disincentives to the local industry, trade friction and threatens jobs," Alacero said. The region's exports reached 9.8 million mt, up 12% year on year. Of this total, 50% were flat products (4.9 million mt), 41% were long products (4 million mt) and 9% were seamless tubes (882,000 mt). Thus it registered a steel trade deficit of 10.8 million mt during January-December. Alacero said this was 2% higher than in the same 12 months in 2016 (11 million mt). Alacero estimated that in January 2018, regional finished steel production came to 4.4 million mt, a 4% year on year increase and 3% up compared to December, and crude steel output was 5.4 million mt, up 4% year on year and 5% on the month.